The Rx Comprehensive Gym Package is widely becoming a must have piece of equipment for affiliate owners worldwide. This Comprehensive Gym Package will not only fit an entire gym population, it will outlast most other brands, dramatically improve your member’s jump rope abilities, increase their learning curve and ultimately improve WOD times. SKU: N/A. 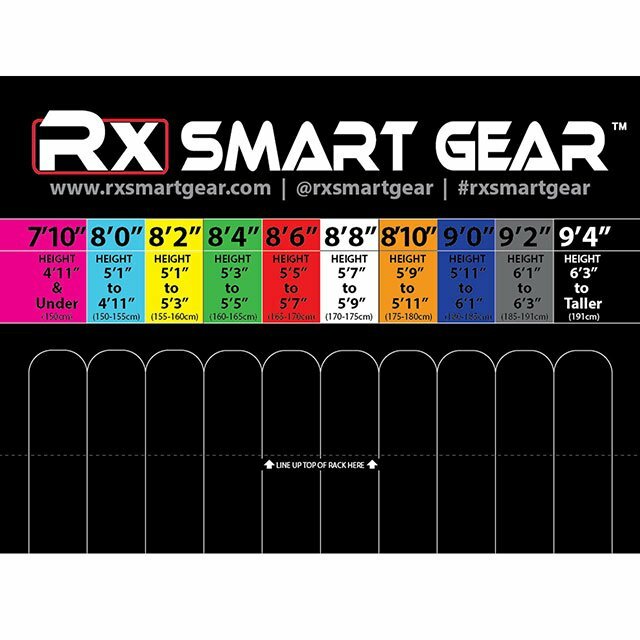 Categories: RX Smart Gear, Rx Jump Ropes. 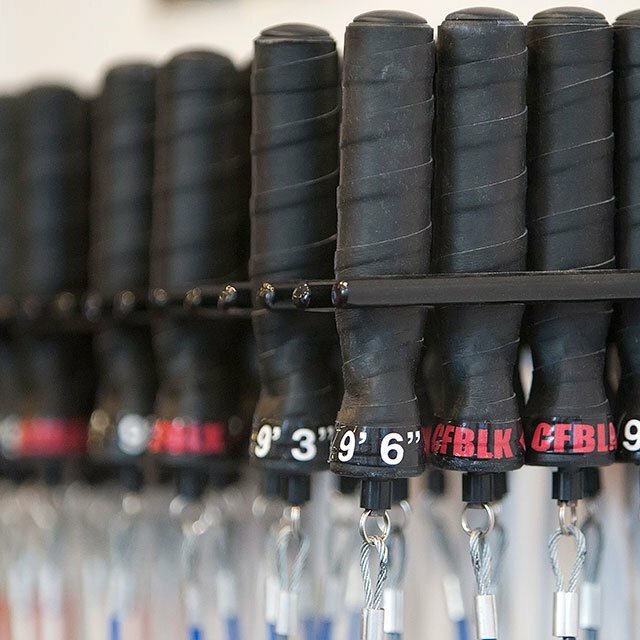 This is the premier jump rope system for the serious gym owner. 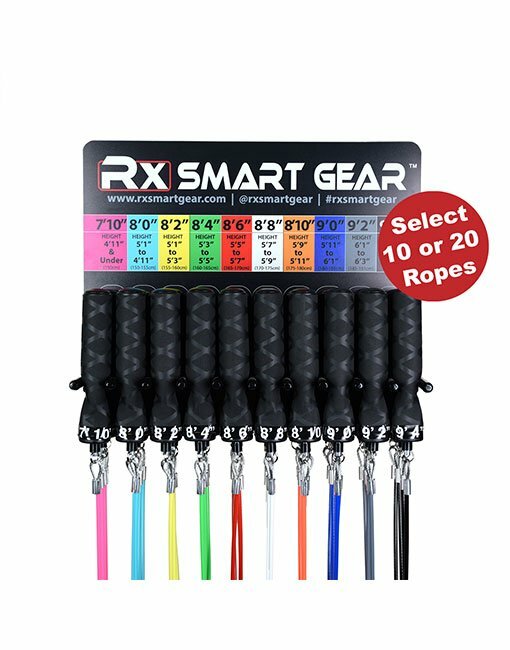 Offering 20 fixed length jump ropes at 10 different sizes this system will fit anyone from 5 feet tall up to nearly 7 feet tall. The strategic lengths allow gym members to dial in their ideal rope length, promote good posture and refine proper technique. Each rope length is indicated on the handle with a corresponding cable color for easy detection. Each jump rope comes with long lasting waterproof traction grip, patented multi-directional swivel bearing system for the smoothest rotations and our best all around training cable made of aircraft grade, pvc coated wire rope. Each gym package includes a wall mounted sizing chart that guides members to their ideal rope length based on their height as well as a wall mounted rope storage rack. Rx Smart Gear pioneered the handles up storage system which prolongs the life of the cable as well as prevents the ropes from tangling. 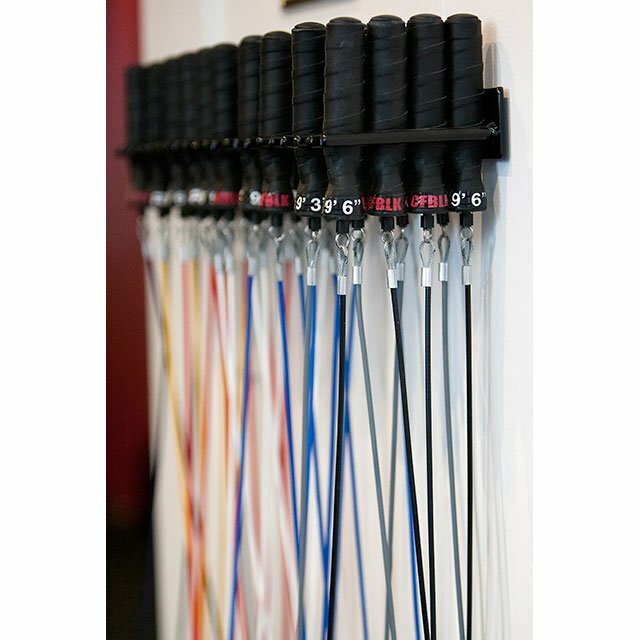 The Custom Rx Gym Package will replace the bees nest of messy jump ropes on your wall with a clean, organized and highly professional piece of training equipment that will let anybody that walks into your gym know you’re a serious gym owner. 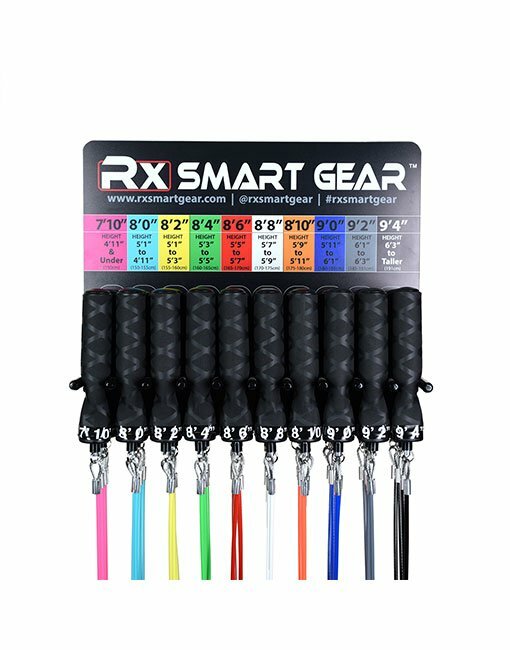 For an additional €35 to cover the graphic & printing charges Rx Smart Gear will co-brand your gym’s logo onto the handle along side our Rx logo. This is a feature that Rx exclusively offer to Gym Owners. This way, the gym owner will always be able to identify the Gym’s house ropes from a privately owned Rx Jump Rope as well as create a professional presentation to any new member walking through the door. All you have to do is just upload your gym’s logo and Rx will take care of the rest. Aircraft grade cable with PVC coating. 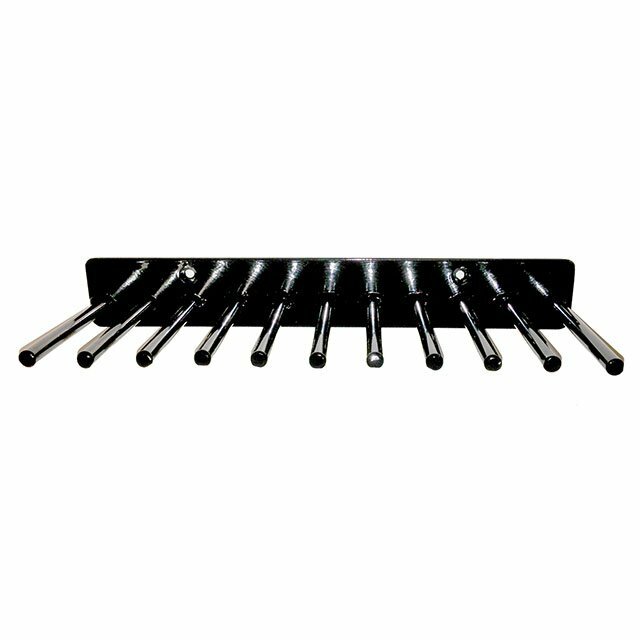 Our mid range weighted cable weighing 2.6 ounces for a 9 foot length (excluding handles). Our most all around utility cable offering a nice blend of light weight with increased feedback and response while it’s rigidity maintains a nice “horse shoe” shape while in motion. Recommended for jumpers who can already turn 50+ double unders. Buff 3.4 – IDEAL FOR BEGINNERS TURNING LESS THAN 50 D/Us. IDEAL FOR ADVANCED LOOKING TO INCREASE INTENSITY. Aircraft grade cable with PVC coating. Our third heaviest cable weighing 3.4 ounces per 9 foot length (excluding handles). Our Dual Threat cable which provides tremendous feedback allowing the athlete to jump with a broader range of tempos from very slow to super fast. Ideal for beginners to gain a better feel for timing while jumping at slower tempos. Also a fantastic training cable for advanced jumpers looking for greater resistance and intensity in their training. All artwork (Logos) must be optimized for a black background as the Rx logo tapes are printed on to black tape. Lighter colored logos work best. Your artwork will be placed in a rectangular space approximately 2 inches wide by 7/16 of an inch tall. Please make sure your artwork is designed to be horizontal and fits in the green box below. Your artwork does not need to fill the whole space, as we will repeat the design/pattern to fill the space as needed. Your artwork must be submitted in either an .jpg, .eps, .ai, .psd or .png file format and have all of its text converted to outlines. This allows Rx to open and view the artwork exactly as you wish it to be seen with out having the necessary fonts installed on the machines. If your artwork meets the minimum guidelines above, you can submit your artwork by forwarding the logo to “info@gearbag.ie” and reference your order reference.